Confused? Don’t be! 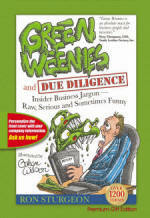 Green Weenies and Due Diligence contains more than 1,200 terms commonly (and sometimes not so commonly) used in today’s ever-changing business climate. From the solemn to the silly, Green Weenies and Due Diligence offers a refreshing and relevant overview of business jargon. You will find it both educational and enlightening. Whether you’re an old hand or a young pup, there’s something to be learned from this book! Order your copy today by clicking here or calling 817-999-0980. Take a look inside the book and see what you will get! See what others are saying about this new book.